The 1st ASTS space maintenance technicians, along with Northrop Grumman members and their Space and Missile Systems Center counterparts at Kirtland Air Force Base, N.M., brought great credit to their field as they lifted a 138,000 pound inert Peacekeeper rocket motor safely onto a tractor trailer. The successful transportation of the Peacekeeper was long awaited, after a month of issues with the existing overhead cranes at the 1st ASTS. The overhead 50 ton cranes are original to the facility and were installed in the 1980’s to support the Peacekeeper Rail Garrison program, which aimed to house 50 active Peacekeeper Intercontinental Ballistic Missile on America’s railway network. A recent safety test highlighted concerns regarding the over 30-year-old cranes, threatening not only the Minotaur Program schedule, but the safety of the members operating them as well. 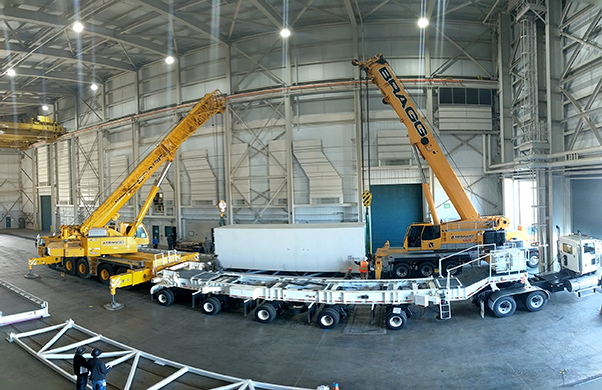 Vandenberg personnel identified a mobile crane solution that ultimately met the mission’s needs and preserved the launch schedule while the overhead cranes received repairs.